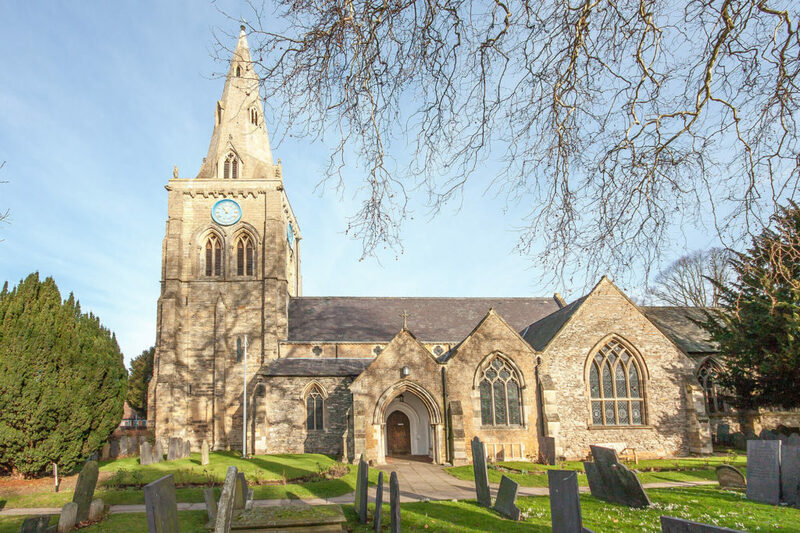 From the Middle ages to the present day, worship has been a constant feature at the heart of our community in the magnificent and historic Church of Bingham. Building is believed to have started in the early part of the 13th century and is thought to have taken 75 years to complete, the structure probably replacing an earlier smaller Church on the site. The earliest work is at the foot of the tower which has one and a half metre thick walls. The rest of the building was erected during the reigns of Kings Edward I and II, these dates being inferred from the styles of decoration. It is thought that the economic prosperity of the area was enhanced by Sir Richard de Bingham who then invested money into the construction. The Tomb of Sir Richard is marked by the effigy of a cross legged knight inside the church. Small fragments of another ancient tomb remain in the church and they probably relate to his son Sir William de Bingham. The earliest record of a rector is in 1226 and by 1291 the town headed the Bingham Deanery. It was about 1320 that the church was completed. This had been a massive undertaking for perhaps only one hundred households. Most of the masonry was quarried locally but some used in the tower is from the Ancaster quarries on the far side of Grantham. Approximately a hundred years later a second flurry of building took place under the new Lords of the Manor the Rempstones who replaced the de Binghams. Sir Thomas Rempstone was buried in the Church after drowning in the Thames in 1406. Two windows in the East side of the North transept were replaced at about the time of his son’s death and contained the family coat of arms. The Tudor and Stuart Period has bestowed the oldest of our bells, it is believed to have been cast to commemorate the English defeat of the Spanish Armada in 1588. Another is dated 1647 which was soon after the Civil War and the Plague. The third was added after the Restoration in 1662. The Restoration and Georgian Periods brought about a revolution in the economic life of the area and the physical appearance of the town, almost certainly as a result of the then landowner Philip Stanhope, the second Earl of Chesterfield. The strip farming methods were replaced by the enclosed fields largely surviving today. The church was largely involved in collecting the tithe as well as ministering to the people. Bingham was recognised as the wealthiest parish in Nottinghamshire. Bingham had only two rectors from 1711 to 1810 although they both bought with them difficulties. In the case of the former ill health and the later a penchant for the good life and a litigious nature. Little building was done in this time although 3 further bells were added in 1730 1743 and 1774 although some ornate plaster work done at the time has now vanished. A new marble Altar slab was brought from Bakewell in the Peak district in 1769 although this is also now gone. However the south transept south window contains two small glass plaques of 18th century date and some of the stained glass of the south windows of the chancel dates probably from the 1830’s. The Victorian and Edwardian eras were important for the church in Bingham, with the arrival of Rev. Robert Miles in 1845 there were to be important changes. He enlisted the help of Sir George Gilbert Scott, one of the foremost ‘Gothic’ architects of the time, to restore the church and make other improvements in 1845-46; he also built a church school now known as Church House at around the same time. During his time much stained glass was added and religious art painted on the interior. Later these paintings were removed and replaced elaborate furnishings during the time of Cannon Henry Hutt. The overall appearance of the church had been transformed from its traditional simple rustic dilapidated appearance to a perhaps over-restored but well ordered state full of finely carved woodwork and colourful stained glass. Since the rectorship of Cannon Hutt the church has been well maintained. Bishop Gelsthorpe ( rector from 1953 to 1963 ) established a side chapel in the South transept and the oak Altar and Reredos are still in place. The Oak screen, door to the tower and the altar rails were also erected at this time. From 1982 to 1994 under Rev. David Swain a nave platform with access for the disabled was built and a sound system installed. The church can now be used for concerts,, school services and other special occasions as well as its regular services. A fine Hanging Cross was installed in 1992 as a memorial to the townspeople who died in World War II. Trusting in the Lord Jesus Christ to preserve the churches growth for future generations, we look forward with optimism and enthusiasm!